Is a lax compliance culture still evident as big Pharma moves into emerging markets? Few industries are as exposed to risk as the pharmaceutical sector. While South Korea has a score of 56 in the 2015 Transparency International (TI) Corruption Perception Index, ranking at 37 out of 167 nations scored, in many emerging markets the risks of corruption are even greater. Pharmaceutical companies should be focusing on enhanced due diligence in high risk territories, as regulators focus on holding organisations and individuals to account for anti-bribery and corruption failures. The recent allegations of bribery against Novartis Korea have shone the media spotlight back onto the industry, but this is by no means the first high-profile case – there have been frequent examples of large multinationals paying the price for compliance failures. These cases demonstrate how crucial it is for large, multinational companies in the pharmaceutical industry to have detailed supply chain oversight, and why enhanced due diligence in high-risk countries is one of the best ways to mitigate risk in this area. Earlier in February 2016, SciClone Pharmaceuticals agreed to pay more than $12 million to settle charges that it violated the Foreign Corrupt Practices Act (FCPA) when international subsidiaries made illegal payments to health care professionals employed at state health institutions in China. In 2011, Johnson & Johnson, the world's second-biggest pharmaceutical company, was fined $70 million after admitting bribery charges. The company made kickback payments in Iraq, one of the TI Corruption Perception Index's worst performing nations, to win contracts and sell drugs and artificial joints. The shift in focus of regulators on both sides of the Atlantic towards seeking individual accountability of those responsible for bribery and corruption failures may be the catalyst needed to improve the culture of compliance in the global pharmaceutical industry. In a background paper prepared for the OECD Symposium on Anti-Corruption Development Assistance, 'Good Practices among Providers of Development Co-operation', Robert Klitgaard, a leading global expert on corruption, laid out an analytical model for the existence of corruption and how to tackle it effectively. Klitgaard said, "Metaphorically, corruption follows a formula: corruption equals monopoly plus discretion minus accountability: C = M + D – A. To reduce corruption, reduce monopoly, limit official discretion and enhance accountability." The Yates memorandum – a new approach, outlined by the United States DoJ, designed to hold individuals accountable for compliance breaches – is bringing the accountability aspect of this formula into action. In late 2015, Carl Reichel, the president of Warner Chilcott, a subsidiary of Allergen, was arrested following allegations that Warner Chilcott – which has already agreed to pay $125 million in civil and criminal fines – used kickbacks to provide doctors with meals and speaking fees in an effort to increase sales of prescription drugs. Establishing the guilt of a CEO of a large corporation is difficult. In the words of the Yates Memorandum, "responsibility can be diffuse and decisions are made at various levels." However, increasing awareness by company executives of regulators focus on individual accountability should cause a shift in compliance focus for global organisations moving into high-risk areas. While the FCPA has continued to extend the US DoJ's reach to overseas jurisdictions, in the UK the Bribery Act (UKBA) is now putting particular pressure on pharmaceutical companies with its new definitions of "commercial organisations" and "associated persons". The UKBA will potentially have a major impact on operations in emerging markets where their involvement with foreign public officials could give rise to new risks of liability under section 6 (bribery of a foreign public official), which would cover doctors and other medical professionals. Pharmaceutical companies are not doing enough to protect themselves from risk, particularly in emerging markets. Only enhanced due diligence procedures on third-parties can help mitigate the dangers associated with high-risk localities, particularly in an industry prone to corruption. Basic compliance and paying up when faced with large fines is no longer enough. In high-risk areas, organisations need to be carrying out in-depth checks on all associated third parties, including business partners and suppliers. When conducting enhanced due diligence, these entities should be checked against sanctions lists, watch lists, and Politically Exposed Persons (PEP) lists. 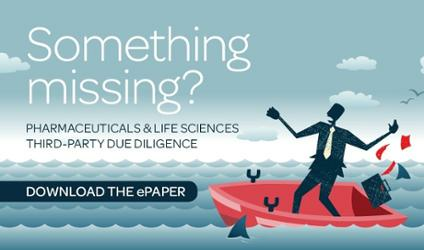 Not only does enhanced due diligence help pharmaceutical companies avoid bribery allegations and reputational damage, but it can provide a company with a lifeline in the event of an unforeseen failure. In the case of a breach of anti-corruption or bribery laws, regulatory authorities are more likely to look favourably on the defendant company where these measures are in place. Under the UKBA, a company can be given a deferred prosecution agreement (DPA), and under the FCPA, a defendant will be given leniency if "comprehensive due diligence demonstrates a genuine commitment to uncovering and preventing FCPA violations."